This guide will show you how to fix a cut in leather, which has only cut the surface of the leather. If the cut has gone all the way through, causing a split in the leather, you should read the tear repair guide. 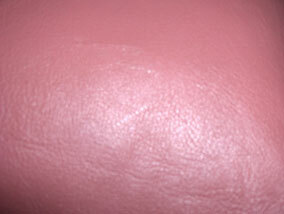 This photo shows a cut in a leather sofa. To fix the cut you will need the following products. Leather Touch Up Kit - This might be needed if the cut doesn't glue together neatly, exposing some of the damaged colour. To repair a cut open the cut out by squeezing either side of it with your fingers. 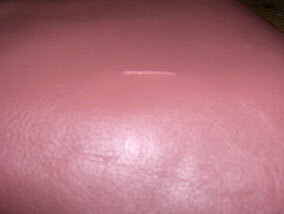 This exposes the leather fibres and will strengthen the repair when the glue is applied. Dip your scalpel into the leather glue so there is a small amount of glue on the end. Then dab the cut with the scalpel length ways to apply the glue. 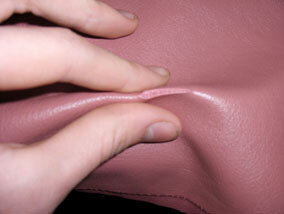 Once you have applied the glue release your grip and push either side of leather back together again. Then using the other end of the scalpel (rounded plastic side) gently press the cut down. Any excess glue can be wiped away with your fingers whilst it is still wet. Hopefully that's all you'll need to do and you'll have a great repair like the one shown in the photo. However, this is not always the case. Sometimes the edges of the cut are worn and require colour applied to blend it in. In this case, you'll need a leather touch up kit. Get both the Leather Repair Kit and the Leather Repair Touch Up Kit with this handy bundle, ideal for tackling a range of minor repairs. Bought individually this kit would cost over HK$640.